The potential rewards from an organisation’s Intellectual Property (IP) assets can be worth celebrating but they need to be balanced with a clear understanding of the risks involved in attaining those rewards. Once IP risks are prioritised, resources are coordinated and applied to mitigate or cushion the probability and the impact of the risk. This important second stage of managing a risk means reducing or eliminating the chance and any consequences if the risk materialises. Although these terms are related and frequently used interchangeably, they do represent different concepts of IP risk. IP risk appetite is an organisation’s willingness or degree of uncertainty that it is prepared to reach with IP risks in order to meet strategic objectives. Risk appetite also accounts for the types of IP risk (eg patentability) and the amount or level of exposure to risk given the activity of the IP type. The specific level of IP threat an organisation is willing to accept in anticipation of a reward is clearly indicated by their IP risk appetite. An organisation with a high IP risk appetite is willing to take on a high level of IP risk which may result in high rewards such as significant company growth. One which wants to play safe or conservatively will have a low IP risk appetite. An organisation’s culture, sector and objectives will determine their IP risk appetite. IP risk tolerance is a different but related concept to that of risk appetite. To define how much IP risk or uncertainty a company can actually handle, IP risk tolerance is used. It is about how sensitive the organisation or people are in coping with the risks. This term provides the level or volume of IP related risks that an organisation will withstand. IP risk tolerance measures the level of risk to which a company is comfortable in reaching when accepting IP risks. Conversely risk tolerance can mean the degree beyond which more IP risk will be avoided. It is project dependent with critical projects demanding higher tolerance to IP related risks than the company may normally accept. IP risk threshold is another concept related to IP risk appetite and tolerance. The threshold considers both the probability and impact of IP related risks. IP risks will be accepted or tolerated if below an organisation’s IP risk threshold. When an IP risk exposure level above the threshold is reached, the company will address the risk and act to avoid or minimise the threat. When IP risks cross above the level set for the IP risk threshold, IP Management must act to bring the exposure back under the threshold level. Setting the level for an IP risk threshold depends on defining risk impact levels as well as a measure of risk probability. Once the IP related risks are clearly recognised and quantified, the company can proactively mitigate or reduce exposure to the IP threats. The focus of risk management needs to be on IP risk mitigation and not just on IP risk assessment. IP risk mitigation involves both minimising the probability and subsequent consequences of a threat if it materialises. 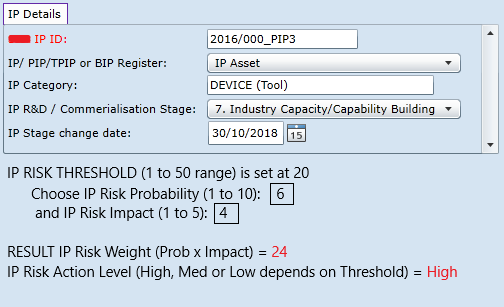 The ability to measure current IP risk against a set IP risk threshold is exceedingly useful in deciding when to act on reducing IP threats. Proactive organisations will want to understand their IP risk threshold and when this level should be raised according to IP management experience. Implementing a threshold of acceptable IP risk is an exercise that helps companies explore their IP and related risks and opportunities. It also enables them to assess their own views of IP risk and the impact of risk exposure. The team at IP Active have the expertise and experience to help with all your IP risk management and commercialisation needs. This includes working with your organisation to identify potential IP assets, develop IP Registers, building customised IP management systems and training staff in all aspects of IP management. We can also guide you in commercialising your IP assets.